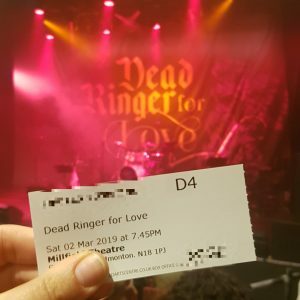 After recently having lost the wonderful Bat Out Of Hell – The Musical in the West End, I found out about a new, small production called Dead Ringer For Love. As I was really missing hearing all the songs belted out on stage, I snagged some seats for this Meatloaf and Cher tribute show. Note: Unfortunately I couldn’t find the names of the performers anywhere, not even of the actual production website. To be fair, this was billed as a tribute show, not a musical, so there’s not really much of a storyline to be found. However, as a tribute concert it was really well done. The first half is dominated by a Meatloaf immitator who does get the vocals stunningly right! 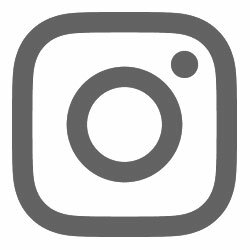 With some of Meatloaf’s biggest hits, it’s a fantastic tribute to the legend, though the female duet singer seemed a little distracted, as if she didn’t really want to be there. After a brilliant lineup of hits, Meatloaf went to take a break and Cher took over. The performer was amazing, she sounded just like Cher and quipped cheekily between songs. Starting out with If I Could Turn Back Time, she went from well known hit to well known hit, encouraging people to dance and sing along. There was an interval for patrons to fill up on drinks, or recycle previous drinks in the loos (loooots of women’s toilets at the Millfield Theatre, barely any queues to deal with), before we were treated to another round of Meatloaf’s hits and Chers greatest songs. 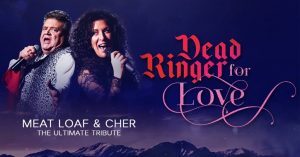 For the final part of the show, both Meatload and Cher sand a row of duets, again rousing the audience to get into it and celebrate. By this point most of us were very warmed up and absolutely in the mood to join in! We had an incredible amount of fun at this show! Though I do need to stress that this is a concert, not a stage musical. However, as a tribute concert it was very well done, definitely put a smile on my face and allowed me to sing along to many of my favourite songs again! If you’re a Meatloaf or Cher fan, definitely catch this great show and let loose a little! Five out of six rainbow sloths from me.